Being a lover of books has its major advantages (diving into countless worlds, meeting hundreds of different people/characters, having an excuse not to participate in a social activity, etc.) to name a few. Of course, with all good things, come the not so good things and among the disadvantages lies these essential questions: How do I make time to read? How do I organize all these books? How do I even know what I WANT to read next? Fret no more, friends, I’ve come up with a few key tips to assist you in making that TBR list (to be read) not so stressful. Let’s dive in! First thing’s first, if you don’t already have your literary lovelies organized, now would be a perfect time to do so. 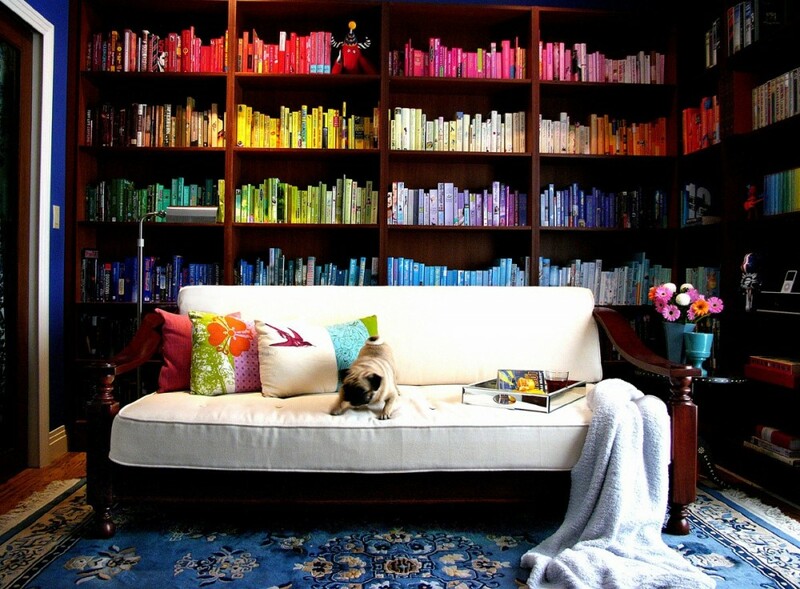 You can organize them by color, author name (first or last, whatever works best for you), size/width, or even genre. Our focus here is that we want to be able to visibly see all of our books, because if we don’t know what we own, of course we’re going to forget about them. I did this while back in school and it honestly helped me quite a bit. If you’re a frequent user of YouTube you may have noticed that many booktubers put out monthly videos of their TBR and some stick to it, while others wander off. Consider writing a list of all of your books you want to read, cut them up into small strips, and then simply pick one out of the jar each time you’re looking for something new to dive into. If you want to take it one step further, you could make separate lists based on genre, and anytime you want to, let’s say, read a Classic, you can just pick a slip out of your ‘Classics’ TBR jar and whalah! This may take some time, depending on how much of a book enthusiast you are, however it is a wonderful way to stay organized and ensure that all of your beautiful books get the attention they deserve. We all get busy and life throws curve-balls at all of us, but at the end of the day, we make time for the things we love and want to make time for. For the bookworm (or bookdragon) reading is one of your most favorite things to do. It allows you to relax and fully escape into a new dimension through delicate pages. So, even if it is just for ten minutes a day, make time for something that you love. We all have a few minutes in the day where we could make better use of our time. Use it doing something you love! Goals can both be a great motivation as well as cause us stress when we don’t quite meet our own expectations. Reading goals are the same way. There’s the GoodReads Book Reading Challenge where you can set a goal for yourself on the amount of books you want to read for the year. It’s fun, but even if you don’t meet it, you shouldn’t beat yourself up. Nor should you feel you must set one. If you desire to, set realistic goals that don’t cause you to stress out if you don’t meet the deadline. Likewise with any hobby, they are meant to de-stress you, not add more to your plate. Your goals can be anything from “Read 15 minutes a day,” or “Read 3 Books this month.” Anything at all. You may have read this elsewhere, though that’s because it’s a wonderful tip! Whether you’re bouncing around to class, work, the gym (this may be a challenge), anywhere at all, consider bringing a book with you. I would recommend not carrying around one that’s exceptionally bulky or heavy because it may get annoying to keep whipping it out, though whatever suits you is good! You’ll be surprised at how much reading you can do just by using the little time you have in between this or that! Some people love chocolate, others love their favorite show, whatever it may be, use it to your advantage! If you love reading and wish you had more time to devote to it, use it as a reward after you’ve completed a task. It’ll make you more cheerful because you made a little time for yourself ( no matter how small) and you were able to get your task(s) done too. Now, if you prefer to only read one book at a time, this one may not be the most appealing to you but if you’re a reader who enjoys reading multiple stories at a time, consider placing a book in the areas you’re in most. No, I don’t mean if you go to Chipotle a lot to hide one of your books in a secret spot in Chipotle. Private places that you spend a lot of time at/in, such as your car, your home office, your den, wherever it may be, place a book there. And keep it there. That way, when you find yourself wandering around from these familiar places or having a bit of free time, you won’t have an excuse to just sit there and do nothing. You can take that time to read if you’d like. Alright, there you have it! 8 tips to help you get that TBR organized and make more time for reading! Let us know if you try any of these tips using the hashtag #AmReading on Facebook and share with us fellow bookworms your own tips and tricks to stay organized and read more!